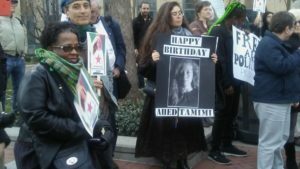 “Happy birthday, dear Ahed, happy birthday to you!” sings a crowd of over 100 people that has gathered outside the Ronald Dellums Federal Building in downtown Oakland. It is late January and they have come to celebrate the 17th birthday of Palestinian teenager, Ahed Tamimi, and hold a vigil in support of her. The vigil in Oakland is one of many held around the world that same day. The crowd periodically chants “Free, free Palestine,” “Free, free Ahed,” and “Free, free all political prisoners.” Several drivers in cars passing by honk their horns in support. Tamimi is a Palestinian teenager who is from Nabi Saleh, a village in the Israeli-occupied West Bank. Israeli forces arrested her in December after she shoved and slapped two well-armed Israeli soldiers outside her home, just hours after her 15-year-old cousin, Mohammad, had been badly injured when an Israeli soldier fired a rubber bullet at close range. The incident occurred at a demonstration sparked by the U.S. president’s decision in early December to recognize Jerusalem as Israel’s capital. On May 14, the U.S. went ahead and opened its embassy in Jerusalem, a controversial action that has been condemned by the international community.? It occurred on the 70th anniversary of the founding of Israel, which is referred to by Palestinians as the Nakba (Catastrophe), and at a time when Israel has killed well over 100 and injured thousands of peacefully-protesting Palestinians in Gaza, many of them children and some of them clearly identifiable journalists. The people of Nabi Saleh have held numerous anti-occupation protests over the years and many of its residents have been killed or injured in peaceful demonstrations. In recent years, several members of Tamimi’s family have suffered injuries and death at the hands of Israeli forces (e.g., her mother was shot in the leg and another cousin, Mustafa, was killed when a high-velocity tear gas canister was fired at close range). When the singing ends at the Oakland vigil, trays of decorated cupcakes are brought out. The candles are extinguished in true birthday fashion and the cupcakes are handed out to vigil participants. Why Did People Come to the Vigil? Why did people come to this vigil on January 31? “I’m here to answer the call from the Tamini family to protest internationally how children have been detained by Israel. Three hundred and sixty children have been detained. The U.S. government supports this with our tax dollars,” says Palestinian American, Sharif Zakout, of the Arab Resource and Organizing Center (AROC). “I’m here because I support Palestinian human rights. I met her father two times. We must free Palestine. 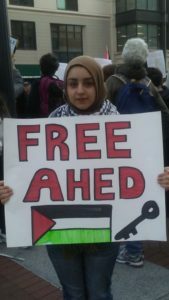 We must free Ahed. 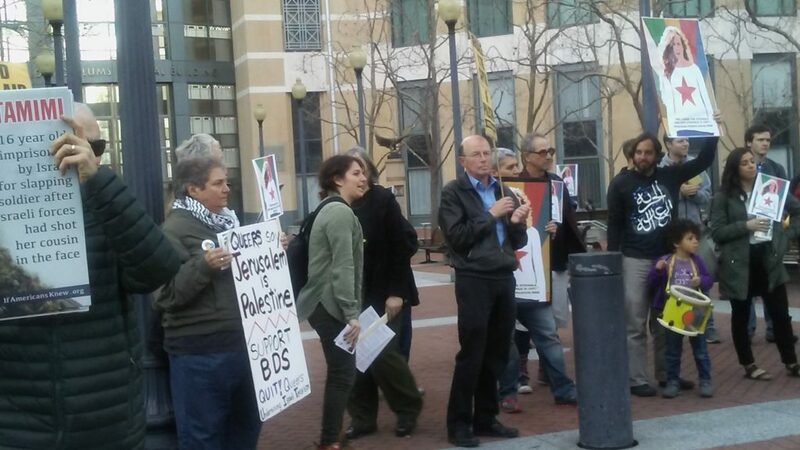 We must end the occupation and end it now,” says Cheryl Davila, Berkeley City Council member, who has been a staunch supporter of Palestinians since the 2014 Israeli bombardment of Gaza, in which over 2,000 Palestinians were killed, including over 500 children. “I’m here because Israel is an apartheid state and people have the right to resist,” says Margaret Fouda, with NorCal Friends of Sabeel. “There are separate roads for Israelis and Palestinians. There are separate schools for Israelis and Palestinians. It’s like Jim Crow south,” she adds. 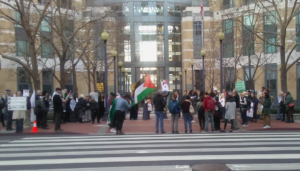 It is telling that the vigil is being held in front of the federal building named after the now-retired Congressman from Oakland, Ron Dellums, who spearheaded the campaign in the U.S. Congress to end South African apartheid. A young woman attending the vigil is with Palestine Youth Network (PYN) and Palestine Action Network (PAN); she is a Palestinian American born and raised in the Bay Area. She asked to remain anonymous because of concerns about retaliation by the Israeli government. Her father is from Yaffa, an ancient Palestinian city on the Mediterranean coast (called Jaffa by Israel). “His parents were displaced by Zionists, at gunpoint (in 1948). My father was raised in a refugee camp,” she says. “My family in Yaffa lives in a makeshift ghetto. The family home was destroyed and is (now) under a parking lot.” She says she is at the vigil, “Because Ahed is spending her 17th birthday in military prison. She’s extremely strong.” The young activist thinks the vigil will raise awareness of the case and the larger incarceration (of children). 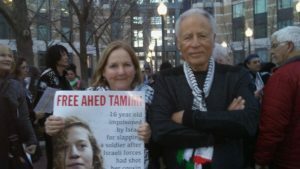 In March, almost two months after the vigil in Oakland, Tamimi was finally tried in an Israeli military court. However, the judge did not allow observers, except for family members. “The court decided what is best for the court, and not what is good for Ahed,” commented Tamimi’s lawyer, Gaby Lasky, as reported by Mondoweiss. 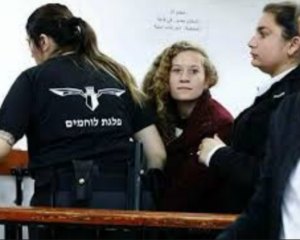 “It seems like it finally dawned on them that there’s something shameful about the proceedings against (Ahed), and that it is better to hold a secret trial rather than make public this legal farce,” Lasky told The Electronic Intifada. Tamimi was found guilty and was sentenced to eight months in prison and a fine of 5,000 shekels (about $1,500). Because of concern over the treatment of Palestinian children at the hands of Israel, Congresswoman Betty McCollum (DFL-Minn.) has introduced legislation to prevent the use of U.S. tax dollars to fund Israel’s detention and mistreatment of Palestinian children. (https://mccollum.house.gov/palestinianchildrensrights). This bill, Promoting Human Rights by Ending Israeli Military Detention of Palestinian Children Act, HR 4391, has 21 co-signers, including four Northern California representatives, Barbara Lee, Jackie Speier, Anna Eshoo, and Ro Khanna. As H.R. 4391 points out, the following practices committed by Israel have been documented: Palestinian children do not have the right to a lawyer during interrogation; a majority of children are physically assaulted following arrest; ‘‘administrative detention’’ is used against children, which means they may be held indefinitely, without charge or trial; and Palestinian children are intimidated into signing confessions written in Hebrew, a language that most do not read, which are then used against them in court. 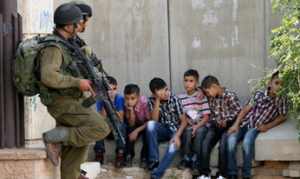 “The most common charge levied against children is throwing stones,” reports Addameer, the Palestinian Human Rights and Prisoner Support Association located in Jerusalem. Stone throwing is punishable under military law by up to 20 years in prison (http://www.addameer.org/the_prisoners/children). 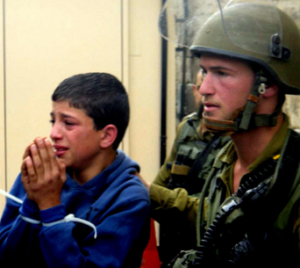 According to Addameer, since 2000,?more than 12,000 Palestinian children?have been detained and their arrests are used to recruit them as informants; to force families to pay large fines to secure the release of their children; and to exert pressure on Palestinians to stop resisting the occupation. Ahed Tamimi is one of the 12,000+ Palestinian children whose lives have been adversely affected by the Israeli occupation, and she is seen by many as a beacon of righteous resistance. “We learn from Ahed’s resilience. 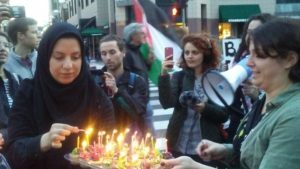 She’s a special spirit, not unique, but representative of Palestine,” said a young vigil participant. 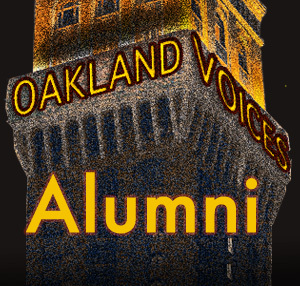 Katharine Davies Samway grew up in England, but has lived in the U.S. for over 40 years, 30 of them in Oakland. She is an educator, researcher, and writer. The abuse of Palestinians by the Israeli government is going on for 70 yeas and our government is part of the problem. Many thanks for the article. the nation seems not to give a damn at this point in time, with the exception of a very tiny minority. Speaking truth to power is never easy but is always the clearest way to sound the call for justice for the opressed! Congratulations on your concise condemnation of Israeli hypocracy and dastardly propaganda. Thanks to Katharine Samway for a tragic story that needs telling, listening, and response. Katharine’s response is her excellent writing , coupled with a compassionate heart.